Empathy map: How it improves your relationship with your customers. Have you ever tried to ask your acquaintances why they work? Possibly most answers will be, “to make money”, “to pay my bills “or “to survive”. But have you considered that it’s possible to be happier and make a lot of money by not focusing on “you” and creating a business that solves people’s problems? This is the purpose of an empathy map. If by now, you haven’t exactly understood the relationship between having a higher purpose for your business other than only money and profitability, hang on for a little longer. 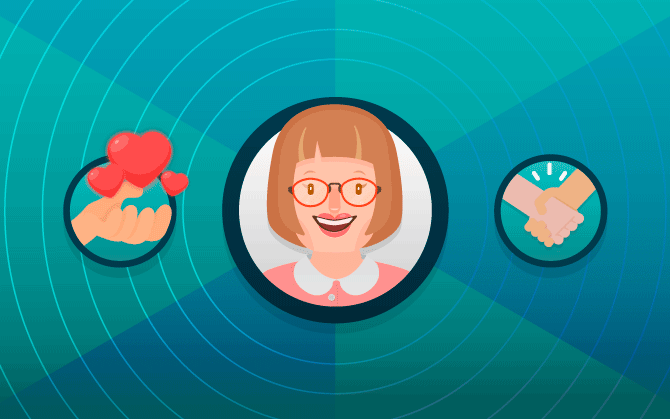 In this post, we’re going to talk about this subject and show you how an empathy map will help you understand your customers better, how to relate to them properly and increase your sales. Check it out! Do you know what the purpose of your work is? For some time now, organizations have started to worry about the purpose of their actions. Finding out the impact that their products and services have on the lives of their consumers and society as a whole, not only makes these activities more significant but also facilitates communication with the public and their relationship with customers. In a nutshell, we can say that a successful business isn’t one that simply “does something “. Large organizations— and we can extend this concept to professionals individually —, are those who have found out “why to do something “, in other words, how their actions improve people’s lives. And what is the importance of this? When the purposes of the target audience and the company are aligned, customers realize that by buying the company’s products and services, their personal goals are achieved. It attracts customers because it doesn’t merely offer goods, but contributes to making dreams come true. In this context, it’s very important that companies develop an empathy map. After all, how will it align its purposes to those of customers if it doesn’t know them, doesn’t know their pain and needs, their desires and the obstacles they face to achieve them? How will the company develop products and services that are compatible with what its customers need? An empathy map is a visual tool developed to help you create and describe your persona. It helps your company to put itself in the place of consumers and to see the business from their point of view. This perception is influenced by several demographic, socioeconomic, personal and behavioral factors. By creating an empathy map, companies focus on customers. By understanding these people, you’ll be able to identify business opportunities, adapt products or services to the needs of the public, find more efficient ways of communicating with customers and provide quality service, as well as develop precise sales strategies. How does an empathy map work? What the customer says and does — Finally, find out how your public behaves, understand what they do at work and during their free time, their hobbies and even how they interact on social media. Identify their favorite subjects and the type of language that captures their attention. After analyzing these items in detail, you will have an x-ray of your persona. This will allow your company to see what your public’s pain and needs are so you can develop products to solve these problems as best as possible and address this group effectively. Now that you understand the importance of this tool, let’s move on to the main steps to build it! If you already have a customer base, use their data to build your empathy map. Records may provide valuable information that will help you create this image, showing who the consumers are and how they behave regarding the company. In order to gather this information, the only alternative is to research. So, don’t base your empathy map only on assumptions. Interact with people! Besides a good old conversation and forms that you can send via email, check out what they talk about on social media or create polls. But make sure you don’t ask too many questions at once, because many people give up on answering them. Relying on the help of customers who have made purchases is very important. They can help you build this empathy map by telling you about the problems they had and how they were solved after they received the product. Many companies have a sales department at the front line. This is the department that talks to consumers, listens to their pains and know the reality they face. It also knows who influences their decisions — friends, relatives, spouse, social or work circles. Gather these people for a brainstorming session and collect all of these ideas. In other companies, the audience you need to reach is internal. In this case, the alternative is to listen to the managers who are closer to these groups and who know their needs. It is also possible to create a direct channel where people can express their opinions, suggestions, and dissatisfactions. Perhaps your company has just opened or is still in its planning phase. How can you gather this information? In this case, find out who’s looking for services similar to yours, i.e., your competitors’ customers. The moment you begin to operate, collect the data and form an initial image — and it doesn’t matter if at the beginning it isn’t very precise, as long as you improve it over time. It’s better to start now and be vaguely right than not having information to know if you’re wrong! Do you see how important it is to create an empathy map? Understanding your audience well will help you develop better products and communicate properly with your customers. If you wish to improve your relationship with your customers even further, click here to understand the importance of providing customer support.